LiU has three main channels for spreading information online. But how are they related to each other, and how should they be used? The Website Management Office explains. The liu.se website contains information and services that are primarily intended for people who are not currently working or studying at LiU. liu.se contains recruitment information for programmes of study and for single-subject courses, intended for prospective students who we hope will apply to LiU. The liu.se website is our most important recruitment channel, and work to formulate attractive texts and to create relevant photos for each course and programme never ceases. Regular usability tests are also carried out, together with analysis of visitors’ behaviour as they browse through the recruitment pages. liu.se is also the university’s main channel for describing and presenting the research carried out here. Many different types of visitor are interested in our research, and this is why we present information at various levels of detail. The descriptions of research areas are given at a level suitable for all readers, including non-specialists, while other pages describe research activities in a manner intended for other researchers around the world. 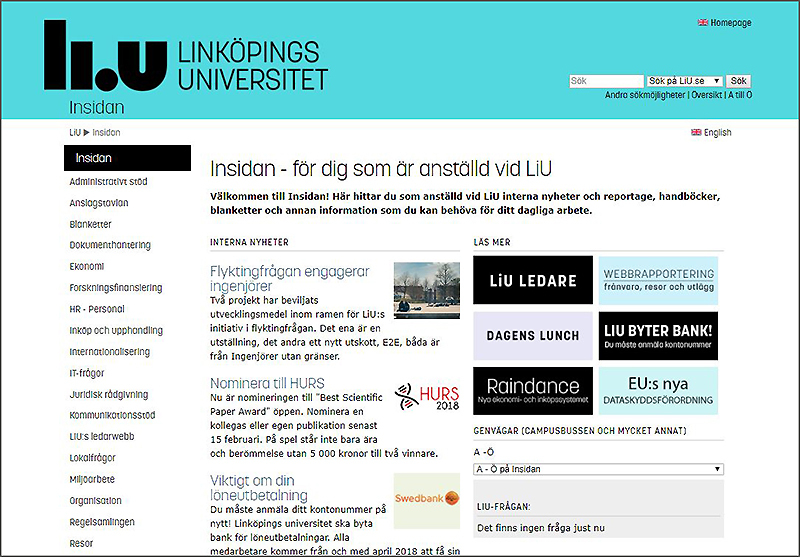 Each faculty and department has its own page on liu.se describing the organisation. It is important here to remember that we also have corresponding internal pages (described below), and that the pages at liu.se are to contain material intended for visitors from outside the university. The personnel profiles on liu.se are highly popular. Each co-worker has a page with contact details and information about his or her role at LiU. The work each person carries out within education and research is presented here, together with publications list, etc. Other information includes the tasks and responsibilities that personnel within administrative support have. liu.se presents also news, information about collaboration, and other material that we as a government agency want to – and are legally required to – present. One of the newly added components on liu.se are the study information pages published by each faculty. These contain detailed information about programmes of study, the courses that are included in the programmes, and single-subject courses. These pages can be found at liu.se/studieinfo. The study information is automatically retrieved from LiU’s new educational database, Bilda. The study information pages present, among other information, curricula for courses and programmes, lists of course literature, and examination components. Each time a course is given, a tab is created here that lists public documents located in the Lisam course room. Course supervisors can label documents in the course room that are also to be available at liu.se/studieinfo. Another central part of the study information pages are the curricula. Each year-group of students can see in detail the courses that are included in the programme of study, and can use the filter function to see courses that are included in any particular specialisation, main area, etc. Direct links are available from the recruitment page at liu.se for a particular course or programme to the study information page for that course or programme. It is possible in this way for students who have not yet been admitted to obtain more details about courses and programmes. Admitted students will have the greatest benefit from the study information pages. This is why they are presented under their own homepage with a search function. 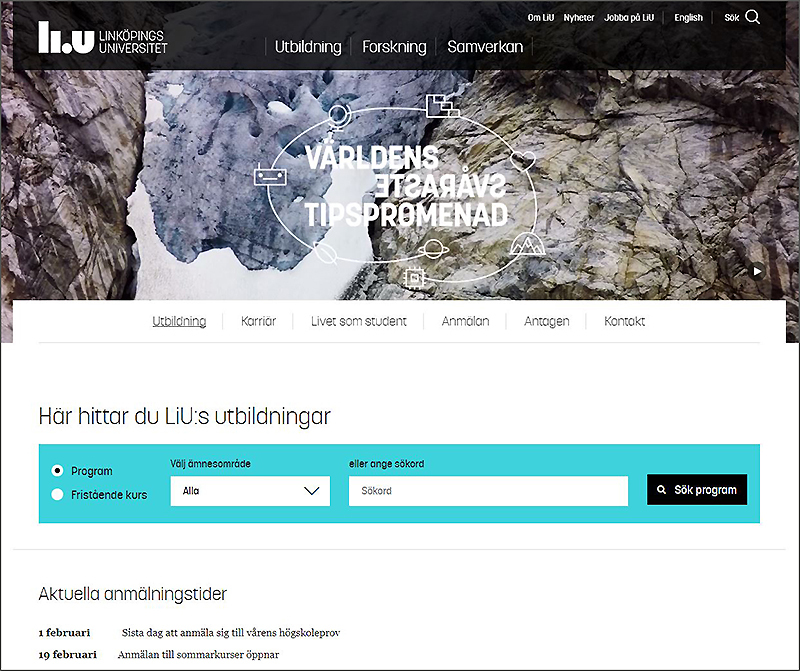 Students can access the pages from student.liu.se, from the course rooms, or from the planned programme rooms in Lisam. student.liu.se is the natural starting point for LiU services and information for admitted students. The structure is similar to that found at most institutions of higher education. These pages contain a great deal of information and portals with links to the various systems that students need to access, such as Lisam and registration for examinations. student.liu.se is, however, much more than just a portal with links to other systems. It contains important information about Student Health, news, information from student associations, etc. It is important that students once admitted are informed that student.liu.se is the natural starting point for obtaining important information. We are currently considering how this can be made clearer in the email sent to students on admission, on the pages for students when they are admitted, and in other feeds that admitted students will see. Note: during the period between a student being admitted and starting to study at LiU, information about preparation for starting studies is available at liu.se/antagen. Inside LiU is the LiU internal website and main channel of information for co-workers. These pages are available at old.liu.se/insidan. A simpler address will be set up soon, in order to gain the same structure as student.liu.se. The new address will be insidan.liu.se (although the old address will remain in use). At the same time, we are introducing several measures to make it clear that Inside LiU is a separate website that is not to be confused with liu.se. For the sake of clarity, we are separating the search functions on the two websites. Until now, we have used a common search page on the new liu.se for both external and internal information, which has created a certain amount of confusion. This solution was, however, necessary during the initial phase, since a great deal of external information remained under the address old.liu.se. It is desired to move pages related to our internal organisation to a structure that has the form insidan.liu.se/[department]. These are currently in a separate structure with the form [department].liu.se, (for example, www.isv.liu.se). Several departments have given a clear structure to their internal organisation pages, and there is no risk that visitors will become confused. Examples are www.ibl.liu.se, www.iei.liu.se and www.isv.liu.se, where it is obvious that these are internal pages, where co-workers log in and access the departmental intranet. A natural step would now be to locate these pages at insidan.liu.se/[department]. More information about this will be given when available. Probably the largest change for us internally following the opening of the new liu.se is that we now have two organisation pages for each faculty and department. A year ago, we had only one, where external and internal information was mixed. It is now possible for us to present a much clearer structure both to external visitors and internal colleagues. External information at liu.se and internal information at insidan.liu.se. It is a good idea to set Inside LiU to be the homepage that appears when you open a web browser. This is the most natural starting point for information and services that co-workers will find useful in their day-to-day activities. Content that is intended for both external and internal target groups must, therefore, be published both at liu.se and on the internal pages. We are often asked when LiU is to develop a new intranet. There is a general desire for this throughout the organisation, but no decision has been taken about timing, etc. For the time being, Inside LiU is our intranet.